Tomato Coeur de Boeuf is a very large, somewhat flattened beefstake tomato. It originates from France. The name means ox-heart. It's a deliciously flavoured tomato with a lot of juicy flesh. It's easy to slice this tomato in thick slices. 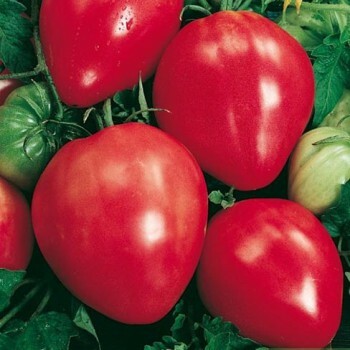 Use this tomato in salads, sauces, soups, on sandwiches, in ketchup and in all dishes with tomatoes. This tomato needs a lot of water, sunlight, warmth and support. Tomatoes contain a lot of vitamin C and Lycopene. The body takes this in better when the tomatoes are heated. Non hardy annual. Height: 180 - 250 cm. Sow indoors from February on in trays filled with moist pottingsoil. Sow shallow and press the seeds gently in the soil, don't cover them with soil, because tomatoes are light germinators. Put the trays away somewhere warm at 20 - 25 °C and cover them with clingfilm or a lid. Keep the temperature as even as possible and don't let the temperature drop during the night. Keep moist, but not to wet to prevent rotting of the seeds. Remove the clingfilm or lid when the seedlings emerge. Transplant the seedlings to seperate pots approx. 10 days after emerging. Put them away a bit cooler at approx. 18 - 20 °C. Harden the tomatoes of, from the middle of May, when there's no longer any danger of nightfrosts. Put the pots at a temperature of 15 - 18 °C for a week and reduce the amount of water for this week. Put the plants outdoors after this week on a sunny and sheltered plot with well draining soil or put them in a greenhouse. Make sure that there is no longer any nightfrost. Tomatoes need some maintenance to ensure a good harvest. Give the plants a sturdy support with some sturdy and large bamboo sticks. Remove all suckers that will form in the axils of your plants. Remove all the leaves below the lowest hanging fruits by the end of July till the beginning of August. Remove all the leaves of all plants together with the tops of all plants from the end of August till the beginning of September to ensure the ripening of most of the green tomatoes. Harvest the tomatoes by cutting them with scissors. Tomatoes can't be kept for a long period. Don't keep your harvested tomatoes in the fridge. So use them a soon as possible after harvesting. Tomatoes used in sauces can be kept frozen to store.